Explore the vast collection of folktales, myths, legends and learn how the chipmunk got its stripes. A long time ago, the Chipmunk looked no different from the Squirrel - he had no stripes. This story tells how he got the distinguishing stripes that we know today. In the deep jungle where all the animals lived, a season of very heavy rains had caused the forest to grow so thick that it was difficult for the animals to move around the jungle paths. They held a meeting to discuss solutions and decided that every animal that moves on the ground would contribute money to pay for the clearing of the jungle paths. Birds who flew in the sky were exempt from this tax. The Chipmunk who was tiny in size but disproportionately huge in stubbornness said to the other animals, “I will pay no tax even if it means I never walk on the ground again”. So he took to the trees and hopped and jumped from branch to branch without touching the ground. “He’s sure to come down sooner or later” said one of the other animals, “then he will have to pay the tax.” At this, the animals dispersed and went about their business. 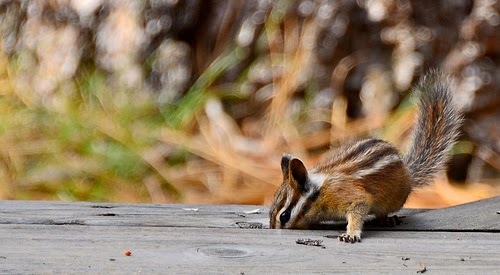 Days passed and the Chipmunk had still not touched the ground. All the other animals, even the famously cunning Tortoise had paid their taxes, but the Chipmunk still would not come down. Some began to feel sorry for him. “Perhaps he has no money, for why else would he suffer and confine himself to a lifetime of hopping on trees?”. They said “It is painful to see one of us land animals reduced to such a lifestyle” and they set up a collection fund to help the Chipmunk. They placed a gourd under an Iroko tree where any animal who wished to help the Chipmunk could put some cowries (for that was the currency at the time) until there was enough to pay his tax. A bird told the Chipmunk about this and the Chipmunk was thoroughly amused. “You mean they have nothing better to do with their money than to pay my tax?” he asked. When night fell, he secretly made his way to the Iroko tree under which the collection gourd lay, climbed down the tree and made away with the gourd. The following morning when this nasty deed was discovered, the animals were rightly upset. They tried to catch the Chipmunk but none could as the Chipmunk was hopping from tree to tree faster than anyone could catch him. The animals decided to banish the Chipmunk from the jungle for he had misused their trust and kindness. Now banished from his former home, the Chipmunk went to live among people. Later on, during one of the several meetings that the animals hold in the jungle, somebody asked if anyone knew what the Chipmunk did with the stolen money and it was said “He never put it to any good use but bought new stripes instead”. All shook their heads in pity.